Who could have thought that one day I will finally take my debate proposition to the stage of the nation and beyond my university’s podium? Whether or Not the Philippines Should Shift to Federalism. And get the chance to argue for the affirmative side not based on draw lots but based on a choice of a lifetime. This is not my constructive speech yet. But a trip down memory lane after 26 years. I am sure these are also fun memories for my contemporaries in college. In 1992, when I started joining collegiate debates, federalism was just a proposition. I spent hours researching for arguments, preparing my constructive speeches, practicing my interpellation, and learning summation skills. I played team captain in many occasions. In the UNOR-R U-Week as an Arts and Sciences freshmen, I joined Talumpati but another college (I think Engineering) beat me to represent our school in the Negros Occidental Private Schools Sports Cultural Educational Association (NOPSSCEA). As a Sophomore, I joined Extemporaneous Speaking, and finally became university champion to go to city level but ended up third place (I think to University of St. La Salle and La Consolacion College). In my junior year, I joined oration and again became university champion (thanks to my coach Miss Chona Mascunana), but I only placed second to a nursing student of Riverside in the NOPSSCEA level. But finally in senior year in 1993 – from out of the blue NOPSSCEAA decided to hold inter-collegiate debates (I remembered the chair at that time was Atty. Jovim Entila). So I joined the university selection debates and the final round was against the College of Engineering. Our team won and earned the right to represent the school. But just a trivia, I was Supreme Student Council President when I was a sophomore and I lost to an Engineering student in my re-election bid. Looking back, Engineering students seem to always beat me. Our team won and went on to NOPSCEAA level and eventually championships. The Best Speaker went to a beautiful and intelligent student of CSA-B named Sofia. I cannot remember which team won – but I bagged Best Debater. If there were no NOPSSCEA inter-collegiate debates since 1993 then I think I still hold the title up to today. I remember in one match, as I was in the podium to deliver my constructive speech for federalism which I wrote in yellow pad, when I instead suddenly I realized what was in my hands was a list of the items I needed to buy from the market (vinegar, soy sauce, fish and the like). For five seconds, I felt the world stopped, but because I have written the piece myself and read it a few times – I began to speak, pretending that the yellow pad was just fine. There was a whole year, I was part of the Argumento De Bombo hosted by Bombo Roque Galvan. I was struggling with the 80% Hiligaynon 20% English rule that I have to do vice versa. I never stood a chance against Bombo Sammy of JBLCF. Only TUPV and JBLCF reached the finals. I have always struggled every time I pick the negative side for federalism. When I became a lawyer in 1998, I joined Centro Federal. I am honored to have been mentored by the late Rey Teves, who was part of Kusog Mindanaw and Lihok Pideral. Teves was part of a constitutional team created a past president. I enjoyed conversations with George Sanchez and Cesar Villanueva. We were planning based on election years, that by 2010, the Philippines will already be a Federal Republic. We started slogans like I am “Fed Up” (of a centralized government) and Go Fed! Rey Teves died with his federal proposition remaining a dream. We went on with our lives leaving behind the dream of 20 years ago, no longer expecting that we can be free of a centralized government, surrendering to the fact that we will always wait for what Manila will say about our future. Our dreams were lost and I had no choice but to move on. I had to contend with as a lawyer and a public servant with the status quo system. 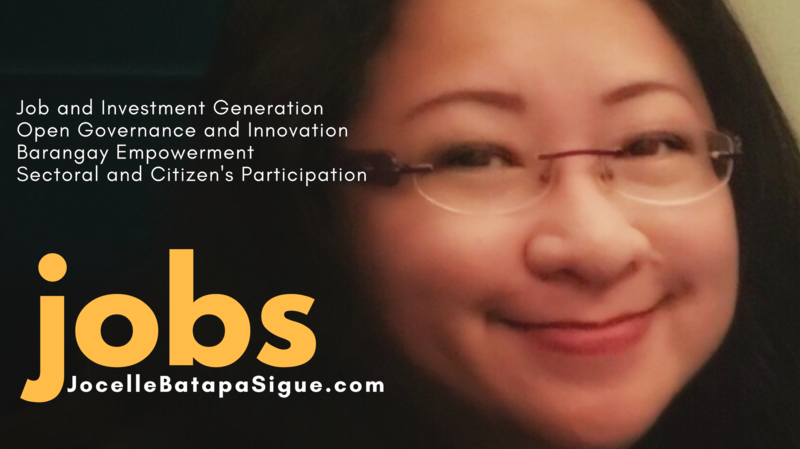 As a city councilor, I had to work harder to get as much inputs from the then Commission on Information and Communications Technology (CICT), a national government body which is centralized under the Office of the President, they had no one in the provinces, except technical people. I had to painstakingly get the attention of national government to include Bacolod in the CyberCorridor program. I had to find connections with a fellow Ilonggo Dondi Mapa then of CICT to spend a day in Bacolod to do a scorecard ranking session of the city. We had to bring a small team in the eServices to just make the world know – Bacolod exists and is open to ICT jobs. The city had to pay 35,00 to 50,000 for a booth to promote Bacolod. I had to sleep in a hostel in Manila worth 800 for 4 people just to manage the promotion. One member of the team even quipped why wasn’t I bothered to sleep with the roaches. I didn’t really see them at night. I was too busy preparing for the exhibitions. We connected with PEZA and all pertinent national government agencies which are mostly concentrating in Manila. I had no choice since this is the reality under a unitary system of government. At times, I had to endure how we were treated as probinsyanos. I had to endure the difficulty of arguing for my city regarding interpretations of national laws – the policy of realty tax incentives with DOF, the long and tortuous lobby to exempt spa and wellness therapists from the public sanitation law requiring pink card and regular smearing, I had to create position papers and talk to DOH. When I heard that taxes for ICT companies will be reduced by the TRAIN package (all else are good provisions), I started to wish economic zones incentives were in the province of region states to give. When I started to be frustrated about how slow the national educational system is in terms of adopting industry calibrated certifications, I began to wish for federalism and significant control of tertiary education under the states so we can forge our future according to our workforce strength. So many things to lobby, to beg national government. Sadly, all these years, I forgot to fight for federalism and simply accepted defeat. In my head, federalism will simply remain as a proposition we debated on in college. It will never happen in the real world. And then suddenly in 2015, I heard a presidential candidate saying he is for federalism. My first impression was – it could just be an electoral gimmick. Then I keep hearing him speak about it. Then I saw groups being formed. Sadly I felt most of them are political groups, just to fuel the fire or to create a bandwagon. At one time, this presidential candidate visited Bacolod for a so-called federalism seminar. I tried my best to attend as an ordinary citizen, sitting at the back, covering my face, but intently listening (sadly at the last part I was identified and publicly acknowledged but I left immediately after his speech to avoid any fanfare). I was frustrated – he consumed the time talking about his love affairs and ways with women, and he was cursing after every sentence. I did not hear him strongly arguing for federalism, except for motherhood statements. I went home telling my husband – this guy has a poor vocabulary of expletives – he only had one, he should learn from Ilonggos our other expletives – which are more cute and less offensive. I kept following the debates to confirm all the presidentiables stand on federalism. Those against – I just needed to forget their names. To me they are going to be leeches and minions of the unitary system. They will become presidents who will constantly want to have absolute control over the whole country. There were presidentiables who were undecided. To me these people are non-entities. I had my eyes set on a government system I want at age 16. These people were 3 times older – but have no decision. Then I think two are for federalism. One is a person I respected so much. But sadly, she is sick. Miriam was my father’s classmate in UP. My father said I need to become a lawyer like her. Si Inday Miriam – wala na ga ligoy – very studious. (And just a side story) My late father had to cope with the fact that her daughter is ligoyan (slacker). I never got to tell my Dad, I did not enrol in pre-week bar reviews. I wanted to balance going to the malls and studying, besides I knew if I told him the exact cost for pre-week classes, he would find it hard to pay. I did not want him to spend further. I was left with one option. Rodrigo Roa Duterte – the one who carried the federalism platform consistently despite his foul language, slurs and imperfections. And for me, he has proven his mettle as a local government official. As two years passed under his term, I have been monitoring the developments. When I visit government agencies, I pick the minds of his people. Everyone seems to be consistent, but somehow I feel everything was self-serving to the President. So many workshops, seminars, “pakain” but nothing moving in the policy side. Again I was back to doubting the process. I did not feel the sincerity especially when I saw more groups flourishing and issuing identification cards. To me, federalism is more than just holding an ID card or being part of the group. It is a mindset that sees the Philippines was created as a nation where each island can unite. It will free us of the subservient thinking that all islands must bow to Las Islas Pilipinas named after a Spanish King and ruled by the Spanish Crown for 333 years. That this ruling power created pueblos and corregimentos (corregimentos being pueblos which have not totally surrendered to Spain hence ruled by a military leader). It will remind us of the pre-Hispanic ages where the barangays, independent from each other, with a ruler, helping one another as a community, but with no central ruler, unless several barangays agree to group themselves. It will make us understand who we really are as a people. Foreigners built this nation. Foreigners built our constitution. It is time to build our own nation and constitution, with all regions coming together as one. An argument against federalism must necessarily be an argument in favor of the unitary system. In argumentation, the burden of proof lies in the affirmative side. But technically – a counter proposition is a strong stance for the negative. I made this graph to show that federalism is more than just charter change – it is a change of mindset, Or even a change of heart. For years, I tried to keep silent because I am aware that there are groups pushing for federalism but paired with parliamentary form. When I saw some of their drafts, I was sad – every provision, from top to bottom, seem to require the nod of the prime minister before the president can act. I did not want to argue with those in favor of parliamentary form when my energies were not even enough to sustain a steady debate for federalism. Since 1992, I was for a presidential federal constitution. So I was silent again, waiting for things to unfold. A few weeks ago, when I read the whole draft of the Constitutional Commission (ConCom) to Review the 1987 Constitution – I jumped with so much joy – finally a presidential – federal constitution. Such joy I expressed on social media. I did not have time to restrain myself – I do not know what force pushed me – knowing I am now just an ordinary citizen, and it would be so assuming on my part to really play any role. But I reached out to people I knew so I can just let people in the ConCom know I support the draft. Suddenly, I was panicking, what if the President do not like the draft, after all a ConCom is just a recommendatory body, not even recognized by the Constitution as compared to the Constituent Assembly or the Constitutional Convention. What if Congress creates their own (which I think is inevitable), and of course I learned that another party was pushing for federal but parliamentary form. By one vote among the ConCom members – presidential won over parliamentary. I pray the parliamentary bloc accept this decision peacefully. I pray Congress will seriously consider the ConCom draft. Finally, July 23, the day of the SONA came, the man I trusted to carry the ball of federalism refrained from cursing, even refrained from blaming any political opponents as I have been hearing in past SONAs, he even refrained from trumpeting his achievements, and instead highlighted his faults. I was spellbound – he was talking systems – he was saying strategies that address the root causes, he was talking structures and policies. A president not offering piecemeal and palliative solutions that will only last within his term. He was practically doing his predecessor a big favor by laying down the foundational policies across all sectors and what need to be fixed thoroughly. The best part for which I am happy about is the endorsement of the President of the ConCom draft. And his words. I am happy that the President of the Republic of the Philippines and I an ordinary citizen share and believe in the same draft. So now let us start the healthy debates with one goal – a true nation for our children. In my future articles, I will share more points about federalism. If we win, we need to nurture the system for it to succeed. If we fail, then at least, we failed standing up for our dream.